Bulb gardening can be easy and fun if you follow some simple guidelines. Many times that the spring blooms don't look exactly like the spectacular picture of the flower on the front of the bulb package. This is because as gardeners, we sometimes fail to follow some of the fundamental rules of bulb gardening. When buying spring bulbs, selecting quality bulbs will assure better success with spring flowers. Visual inspection of the bulbs is essential. They should look healthy without soft spots, bruises, or scars. A bulb should also feel heavy, not light, when you pick it up. A bulb should not be dried out or shriveled. Plant the bulbs as soon as possible or keep them in a cool, dry place. Most of the harbingers of spring are flowers that grow form bulbs. 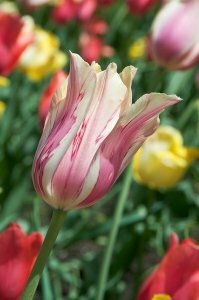 Tulips, Dafodils, Hyacinths, Crocus, and Grape Hyacinths are just a few of the bulb gardening options available to gardeners. Bulb gardening can be used to create many different effects. You can plant the bulbs in groups of five or more of a single variety. You can arrange taller blooming bulbs with shorter bulbs that will bloom at the same time. In limited space areas, the bulbs can be planted in layers. To achieve that effect, dig a hole deep enough for the largest bulbs (like Allium), cover with soil, then plant the next largest bulbs (like Hyacinth), then plant a layer of smaller bulbs (like Crocus). If you select bulbs for their fragrance you can plant in containers, along walkways, near borders, or on the patio. The fragrant bulbs also make wonderful cut flowers. The best time to plant spring bulbs is in the fall before the ground freezes while the ground is still workable; generally between September and early November. In more temperate climates bulbs can be planted between November and January. Flower bulbs do much better in well-drained soil. By adding compost or other organic matter increases the size of the blooms. A mild fertilizer can be used such as bone meal or bulb booster. Select a location and dig a hole with a trowel or shovel depending on the size and type of the bulbs. The general rule is to plant them two to three times as deep as the height of the bulb with the pointed size up. Small bulbs can be spaced about two inches apart and larger bulbs spaced about five inches apart. If you live in an area that gets very cold during the winter, after planting the bulbs cover the soil with straw, dead leaves, or mulch to give them added protection from the cold weather. In the spring when the bulbs begin to break the ground, deer can be a problem. Using deer resistant plant varieties can help deter them. In the springtime, once the blooms have turned brown, cut the flowers off the stem. Keep the stem and foliage to provide nutrients to the bulb to get ready for next year’s blooms. After the leaves turn brown they can be cut down.